President Donald Trump's chief of staff John Kelly attends a news conference with three Baltic leaders and President Donald Trump in the East Room of the White House in Washington, Tuesday, April 3, 2018. When White House Chief of Staff John Kelly said today’s undocumented immigrants are unable to assimilate easily into American society because they do not have skills and do not speak English, the criticism was swift, particularly given his own family history. 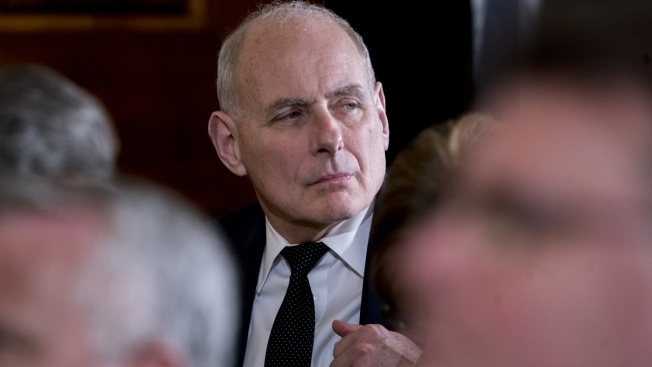 The father of Kelly’s maternal grandmother was a day laborer named John DeMarco who could not read, write nor speak English, according to a copy of a 1900 Census tweeted by journalist Jennifer Mendelsohn. He had been in the United States for 18 years at that point and was not a citizen. The 1930 Census shows DeMarco still was not a citizen, and his wife, Crescenza, had been in the United States for 37 years and did not speak English, tweeted Mendelsohn, who has been searching the genealogical records of people inside the Trump administration and out. Another of Kelly’s great-grandfathers, Giuseppe Pedalino, was a wagon driver, according to the 1910 Census. His second wife, Concetta, was illiterate and also could not speak English, 10 years after arrival, Mendelsohn tweeted. Kelly’s comments were made during an interview with NPR’s John Burnett on "Morning Edition" Friday. Asked about the Trump administration’s policy of separating families who cross the border illegally and prosecuting them, Kelly answered: "Let me step back and tell you that the vast majority of the people that move illegally into the United States are not bad people. They're not criminals. They're not MS-13." He added, "But they're also not people that would easily assimilate into the United States, into our modern society. They're overwhelmingly rural people. In the countries they come from, fourth-, fifth-, sixth-grade educations are kind of the norm. They don't speak English; obviously, that's a big thing .... They don't integrate well; they don't have skills." The White House did not immediately respond to a request for comment about whether Kelly believed his family had integrated well or whether he held today’s immigrants to a different standard. In the interview, Kelly said he sympathized with the reason undocumented immigrants came to the United States but said, "the laws are the laws." Kelly’s critics eagerly pointed to their family’s circumstances and accomplishments and began tweeting under the hashtag "HeyJohnKelly." #HeyJohnKelly, my great-grandmother came here from Sweden, unaccompanied, when she was 9 years old and worked as a housemaid until she was 16. She married and had 5 kids during WWII and the Great Depression. Her English was terrible her whole life. Left: My great-granddad. Came 1913 from rural Ukraine. 1940 alien registration form since he hadn't become a citizen (still illiterate). Right: His grandson (my dad) in Vietnam & a few of his military honors. Chris Lu, a deputy secretary of labor under President Barack Obama, tweeted that his father came from rural China and spoke little English. "He raised a son who held the same rank in the Obama WH (Asst. to the Pres.) that Kelly holds,” he wrote. “I’d say we did okay." Michael Skotnicki, a lawyer and former Alabama Supreme Court staff attorney, tweeted that all four of his grandparents were uneducated Polish and Slavic serfs. His Polish grandmother, who lived in Cleveland, arrived in the U.S. about 1910 and died 70 years later without ever speaking English, he wrote. She had two sons who enlisted in the U.S. Army in World War II, including his father who served as a staff sergeant. "My generation has produced a doctor, engineer, dentist, attorney and many other college-educated professionals," he wrote. Sen. Mazie Hirono, the Democrat from Hawaii, tweeted that she grew up on a rice farm in rural Japan and arrived in Hawaii not speaking a word of English. "John Kelly, you don't understand how immigrants have built our country," she wrote. This was not the first time Kelly has made controversial comments about immigrants. In February, he said of young people who did not sign up for DACA or the Deferred Action for Childhood Arrivals program, which offers protection from deportation: "the people that some would say were too afraid to sign up, others would say were too lazy to get off their asses." A 2008 study in Wisconsin questioned the idea that early immigrants learned English quickly. A University of Wisconsin professor, Joseph Salmons, looked at German immigrants to the state from 1839 to the 1930s and found that they seemed to thrive for decades speaking only German. The Anti-Defamation League noted that immigrants are twice as likely to start businesses as those born in the United States, and that the companies they own are more likely to hire employees. States with large numbers of immigrants report lower unemployment. Immigrants pay between $90 and $140 billion each year in taxes, it wrote, with undocumented immigrants paying more than $11.8 billion in taxes in 2012. More than half of all undocumented immigrant households file income tax returns. And a study from the American Immigration Council found that a higher number of immigrants was associated with lower crime rates, that immigrants were less likely to be behind bars and that immigrants were less likely to engage in criminal behavior. Speaking on the Brian Lehrer Show on WNYC, New York City's public radio station, New York City Bill de Blasio noted that the city's new schools chancellor, Richard Carranza, grew up speaking Spanish, the grandson of immigrants from Mexico. "My grandfather Giovanni, my grandmother Anna came from very small towns, absolutely rural, in impoverished southern Italy, around 100 years ago, with no ability to speak English and very limited skills and they absolutely lived the American dream," de Blasio said. "And their grandson is the mayor of this city." "Let's get real about this," he said. "Are we a city of immigrants and a nation of immigrants, or not?" Mendelsohn herself tweeted that neither of her Latvian grandparents, an illiterate homemaker and a shoemaker, spoke English. She added a copy of her grandparents’ immigration records. "My brothers have PhDs from Princeton and Stanford. See how that works, John Kelly?" she wrote. Of Kelly’s comments, she said, "This is just another example of the selective amnesia and romanticizing many Americans engage in about their immigrant pasts. Every generation of immigrants has looked askance at the next and feared they couldn't properly assimilate and contribute. Kelly's comments are just the latest example."